According to H&R Block, the American Hipster is in a deep crisis – a Hipster Tax Crisis. 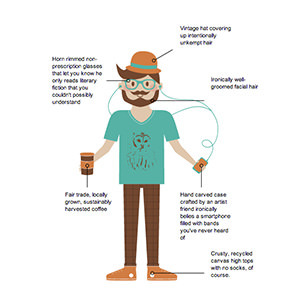 Leading into the 2014 tax season, the company launched a satirical campaign with a cause-marketing element that pokes fun at Hipsters who are, “struggling to file taxes in non-ironic ways.” Created with the goal of showing the more fun side of H&R Block, the campaign is targeted at raising awareness with millennials. The campaign is housed on a dedicated microsite, with content being shared across H&R Block’s social media channels, such as Facebook, Twitter and YouTube. 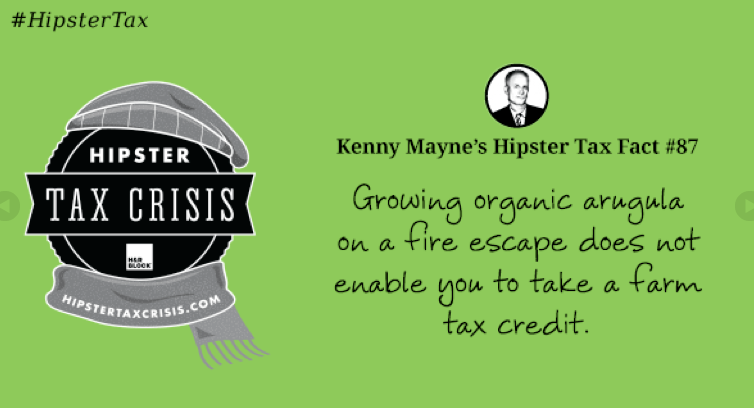 Centered around the theme of the Hipster Tax Crisis, H&R Block curated a series of “Hipster Tax Facts” from campaign spokesperson Kenny Mayne. Mayne, who is well-known for his work with ESPN, also stars in a series of videos on the company’s YouTube channel. There’s also the gem below about what does not qualify you for a farm tax credit. The campaign also offered fans the option to vote for the “Greatest Hipster in History” and an opportunity to “Hipsterize” a photo of yourself. For the “Greatest Hipster in History,” Socrates won the coveted honor for founding Western philosophy before it went mainstream. The option to Hipsterize yourself is still available on the site. Simply upload a photo, play around with your Hipster accessories and you’re set. I couldn’t resist trying it out. 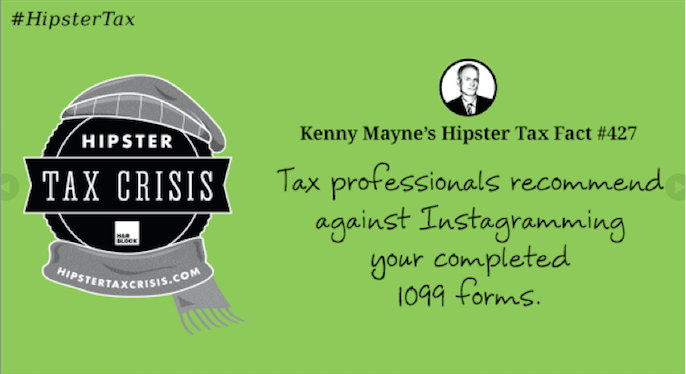 Throughout the campaign, participants are encouraged to share, whether it’s a Hipster Tax Fact or a Hipsterized photo of yourself or something else entirely. For each element shared during the campaign, H&R Block will make a charitable donation to Covenant House, a non-profit serving homeless children, up to $10,000. What can companies learn from H&R Block’s Campaign? Start With Goal Setting: H&R Block had a specific goal for this campaign – to raise awareness of the brand with the millennial audience. By setting a goal and identifying a target audience, they were able to think outside of the box and develop an innovative campaign with KPIs to measure success around this goal. Know Your Target Audience: According to H&R Block, the millennial audience typically files their taxes early using online software. Depending on how early the millennial audience files their taxes, the company could structure the campaign accordingly around raising awareness, engagement, share of voice, in addition to volume from the target audience who used H&R Block to complete their taxes. 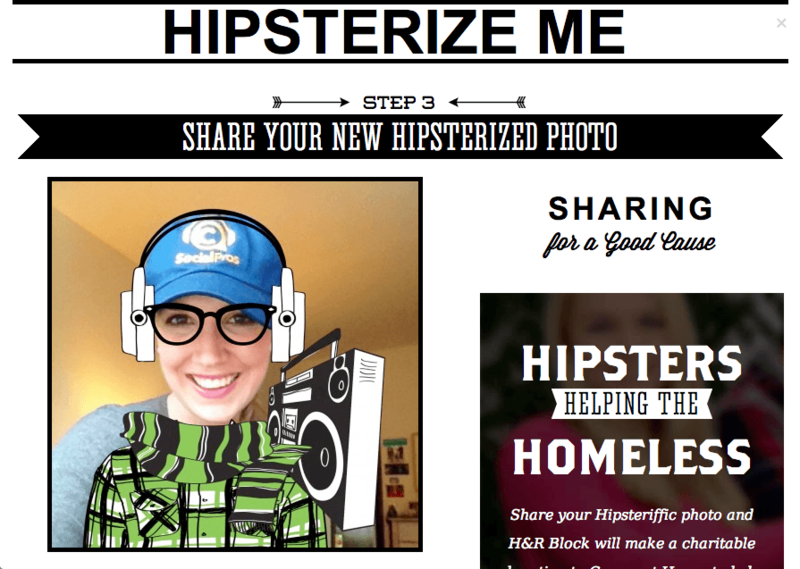 Create Multiple Opportunities for Engagement: By leaning heavily on creative visuals, the Hipster Tax Facts and “Hipsterize Me” features became highly shareable pieces of content. Each piece of visual content related back to the overall story H&R Block wanted to tell with the campaign, allowing them to pull in new participants through word-of-mouth endorsement and social sharing. Reward Participants for Sharing Content: While marketers always aim for campaigns to be highly shareable, offering a donation to a non-profit for sharing was a nice way of saying thank you to people who participated. For other types of campaigns, it can also be a good strategy for tapping into advocates for a specific non-profit or cause that helps to spark awareness for the initiative. Consider Additional Channels: Although the campaign primarily lived on the dedicated microsite, Facebook, Twitter and YouTube, the company could have considered additional ways for personalizing content to further extend the reach. Instagram and Vine videos could have been leveraged for the most popular Hipster Tax Facts. Pinterest, for example, also has a dedicated Hipster Tax Crisis board, but none of the Hipster Tax Facts were pinned. Given the interest in sharing quotes and fact based visuals on Pinterest, it would have been a good channel to leverage as well.